1. Brush the aubergine slices with oil and season. Griddle in 2 batches for 2-3 minutes each side or until softened and golden. Wrap in foil to keep warm. 2. Meanwhile, cook the peas and butter beans in boiling water for 3 minutes, then drain and coarsely crush with half the mint, the crème fraÎche and seasoning. 3. 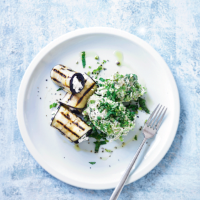 Mix the remaining mint into the goat’s cheese and spread onto the aubergines. Roll up each one up, and serve with the pea and butter bean crush.